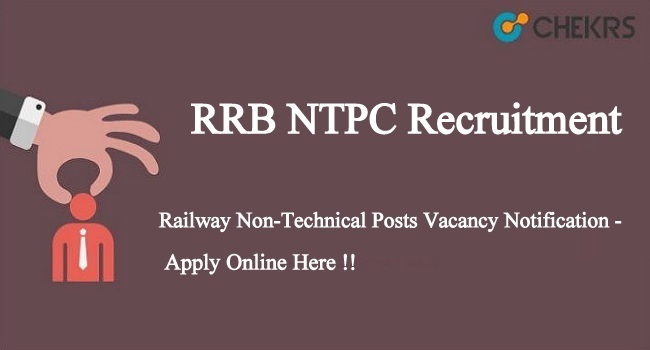 RRB NTPC Recruitment 2019: Indian Railway Recruitment Board (RRB) invites online application from the eligible candidates for the various Non-Technical Popular Categories (NTPC) posts. Interested candidates can download the Railway NTPC Notification 2019 pdf through the official website and check eligibility details. Candidates who want to join the Railway jobs can check the post wise vacancy details & fill the online application form through official website on or before the last date. RRB NTPC Online Application form will be started on 28th February 2019. 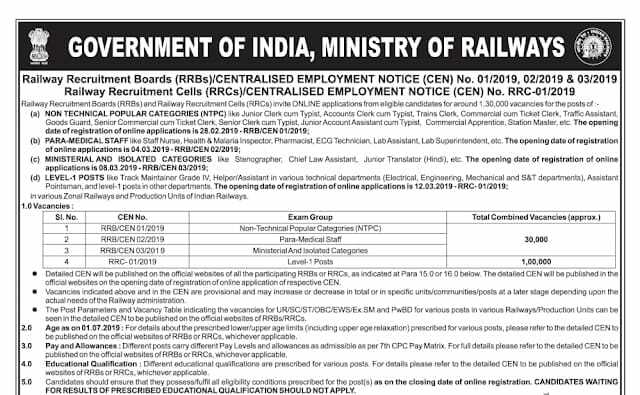 Candidates before applying the Railway Recruitment Board posts can download the advertisement pdf check the terms & conditions carefully. Aspirants can check the NTPC application dates, age limit, educational qualification, post-wise vacancies, RRB Selection Criteria, application process, pay scale, and more details in the below article. Contestants who want to apply for the Railway notification all need to confirm their eligibility and fill the online application form on or before the last date through the RRB official website. After successful submission of application, aspirants take a copy of online form & fee receipt for further preferences. The exam admits card of Railway NTPC will release on the official website. Aspirants who submitted the application form those can get the Railway RRC NTPC Exam Hall Ticket 2019. Candidates by using the application/registration number and date of birth or password can download the RRB exam hall ticket. The RRB NTPC Call Letter will contain details like application number, hall ticket number, exam date, test time, slot, exam center, candidate details. The Railway Board will not send the exam call letter hard copy by post or email. Applicants without exam hall ticket, won’t able to attend the written test. Aspirants who have attended the exam can check the RRB NTPC Exam Result 2019 from the official web page. Applicants by using the exam hall ticket number and password can check the written examination result. Aspirants by using the exam admit card number and date of birth or password can check the result through RRB web portal. Applicants will be able to check the merit list and Railway NTPC Cutoff Marks 2019 after the announcement of exam result. Candidates who will qualify in the exam will shortlist for the next selection process. Remarks: For more details of Railway RRB NTPC Recruitment 2019 can check official notification pdf. Any doubts regarding the Railway notification you can discuss with us in the comment box.